Home→Our Journey→On the Water→Chillin’…..Or Not???? 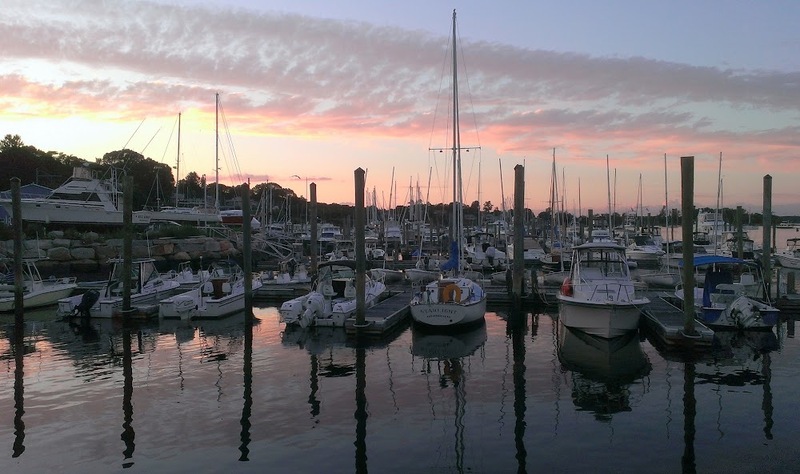 After our super fun three week trip to Maine, we landed back in East Greenwich, RI on July 14th. 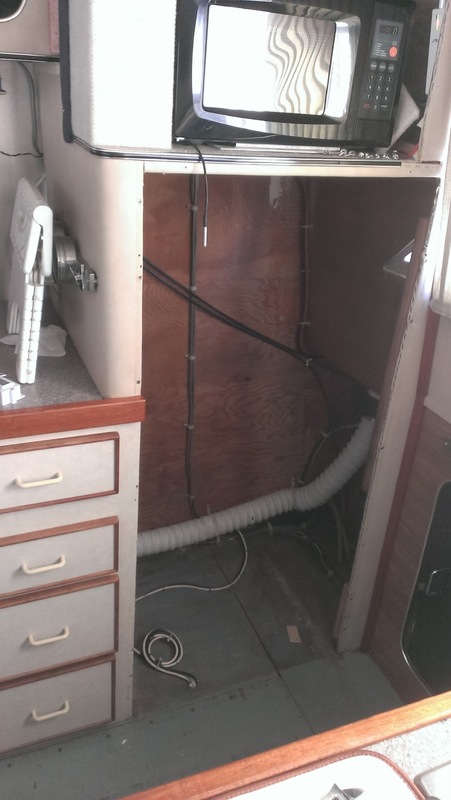 Before moving ourselves and the kitties from the coach to full time living on the boat, we had a few boat projects we wanted to complete. 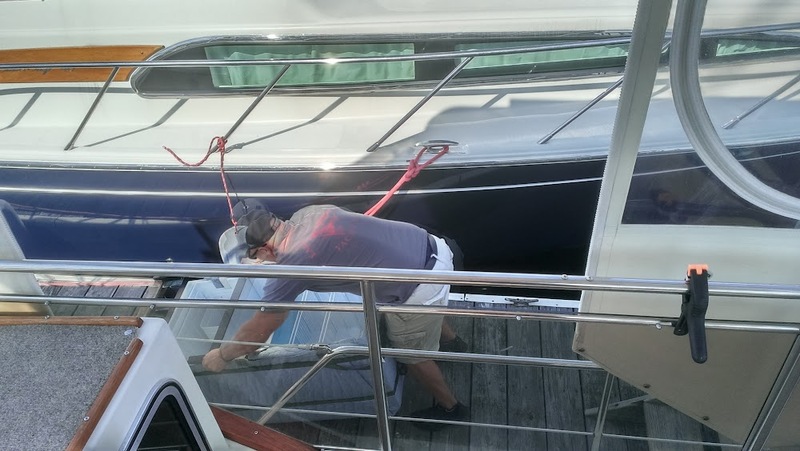 First on the priority list was to replace the mattress in the aft cabin. 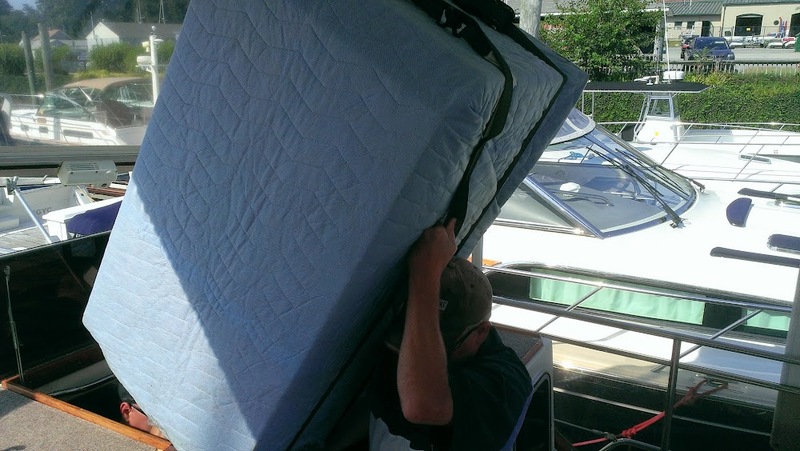 Yes, it was time to get rid of our very old (the boat is a 1985), very uncomfortable and lumpy mattress. You might think that would be simple but of course it wasn’t. 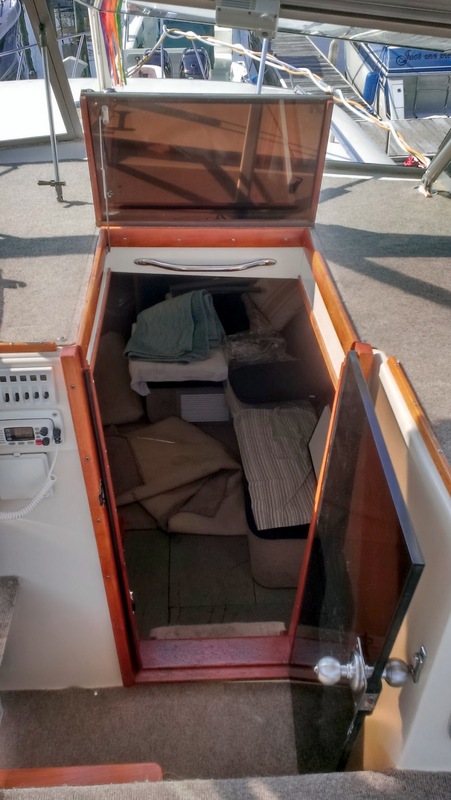 Similar to RV’s, particularly older ones, beds on boats often have weird shapes, usually wider at the top and narrower at the foot so standard size full or queen mattresses don’t fit. In the hopes of getting a slightly bigger mattress than our existing one, Rob decided to rebuild the old and grungy headboard and the frame. Won’t get into a lot of detail here but the next steps involved a lot of destruction, visits to our favorite home supply stores for lumber, lots of sawing, sanding, stapling, drilling and hammering during the reconstruction. Things were going well until our existing Norcold (aka No Cold) refrigerator decided it was tired of chillin’. Not sure if this was the original fridge or a replacement added before we bought the boat in 2005, but regardless it has had better days. Over the past few years we had been having intermittent problems with it but each year we would limp along, reluctant to spend the dollars to replace it. But alas this year, it appeared we had no choice since the interior temp stayed consistently in the mid 50’s. Oh, oh, that obviously wasn’t acceptable. After much research and deliberation we decided it was time to replace it. Although expensive at over $1800 (isn’t anything labelled with “marine” or “RV” always expensive?? 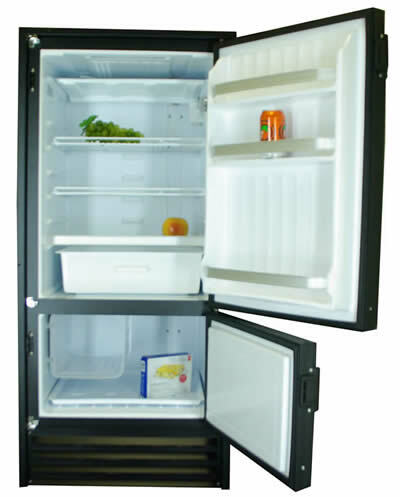 ), we decided on a Nova Kool RFU9000 which has almost the exact same outside dimensions as the old Norcold. Although the same footprint, there were major differences between the two units. The old Norcold DE-461 is only 6.3 cu. ft., had a top freezer, rear mounted condenser coils, no active ventilation (which could have been the reason for the problems it was having) and a Chinese compressor. Despite the same outside dimensions, the Nova Kool capacity is relatively huge (well, maybe not really huge but significantly more than the Norcold) at 9.1 cu. ft., had a bottom freezer, bottom condenser coils, active front exhausting ventilation and a super efficient 12 volt Danfoss compressor. The front ventilation exhaust was the primary feature we were looking for since it would be installed in an unventilated space as well as the efficient compressor since we often must run on battery power only. Fortunately we were able to find a distributor, World Wide Enterprises, a small mom and pop type operation, in East Falmouth, MA (about 1-1/2 hours from us on Cape Cod) that had one in stock. 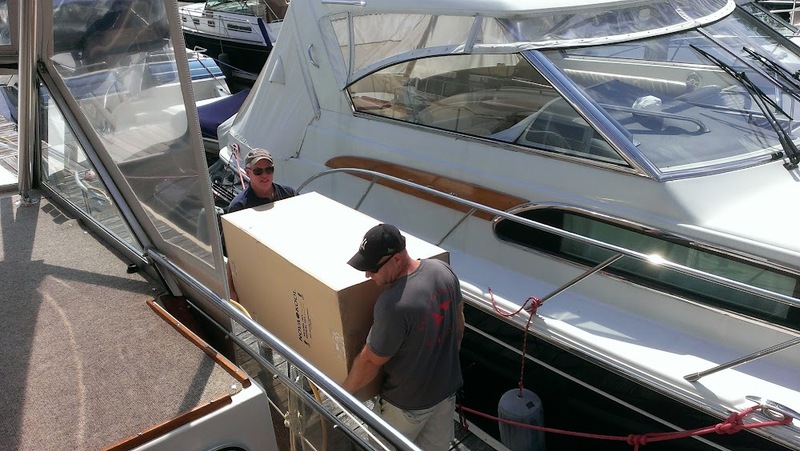 Great, we could pick it up in our van, get it quickly and avoid paying any freight charges – or so we thought! After a few emails and phone calls, we arranged to pick the unit up on Saturday, July 25th. Sounded like a great plan! Well maybe it was great, but it certainly would not be easy! We somehow had to get the old unit out and the new one in. 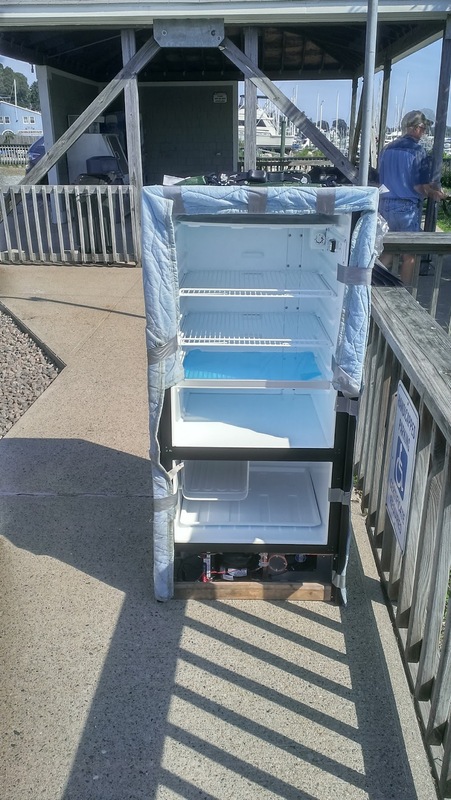 The challenge – how to push a 23-1/2″ wide rectangular refrigerator through a not so rectangular less than 23″ wide doorway. The one doorway to the main cabin has a tapered shape – the top hatch was wide enough for the fridge but the door wasn’t. And the four wooden steps that had to be navigated wouldn’t make it any easier. Take it from one who knows – I slipped on them several weeks ago without carrying anything! 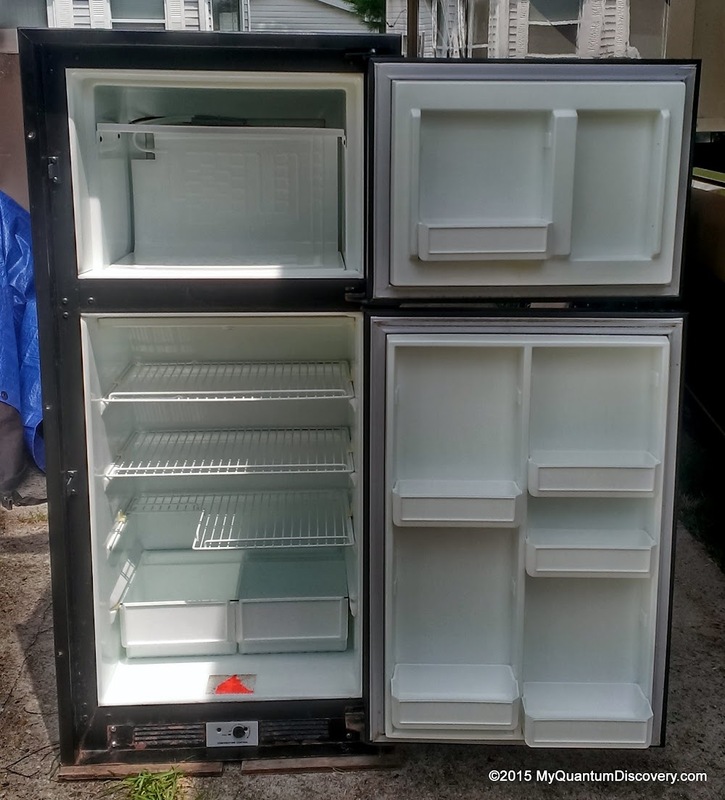 Knowing that the fridge weighed approximately 100 pounds, it would be too awkward for Rob to handle by himself and I couldn’t offer much help in terms of muscle power. So we formulated two plans – one would involve moving the boat over to another dock at the club where there was a crane – assuming we could position the boat correctly, we theorized we could remove the enclosure over the cockpit, then attach the hoist to ratchet straps installed around the fridge and lift it straight up. Then do it in reverse to get the new one on board. Lots of “ifs” in this scenario along with visions of it slipping from the hoist and either landing on the boat or in the water. The second and perhaps easier, less involved plan would require the muscle power of one of the three club stewards. After checking with one of them, Matt quickly volunteered to help. Muscle power would rule! So early on Saturday morning, we headed to East Falmouth on Cape Cod. Boy, what a stupid, stupid move on our part! We should have known better especially me, being a Massachusetts gal and one who has never been particularly enthralled with Cape Cod. For those readers not familiar with the Cape, there are only two highways leading on and off, both crossing Cape Cod Canal via either the Bourne Bridge or the Sagamore Bridge. On weekends during the summer, traffic can be a nightmare, usually backed up for miles leading to and from the bridges. Yep, the closer we got to the Bourne Bridge, traffic came to a crawl resulting in our 1-1/2 hour drive stretching to well over 3 hours. Stop, move 10 feet, then stop again, move 8 feet, then stop again…ugh, you get the picture. Not fun! Eventually we arrived at the storage place where we were to meet Scott from Worldwide Enterprises. After a few minutes of chatting, the fridge was loaded into the van and off we went to retrace our drive. Fortunately, being a Saturday there wasn’t as much traffic leaving the Cape. 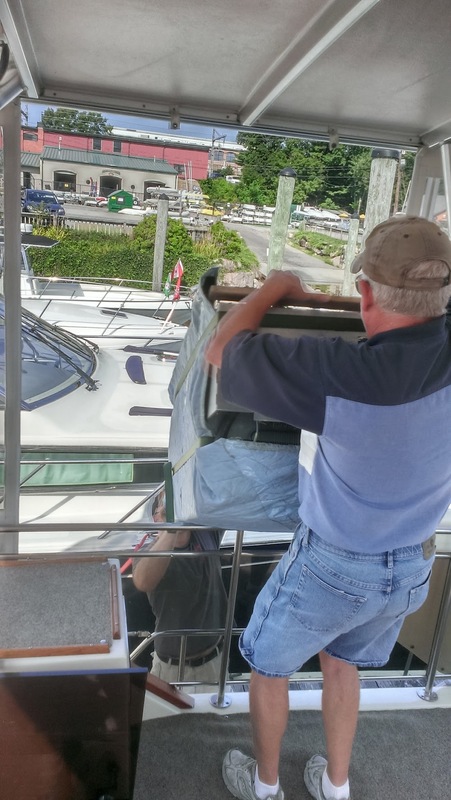 Once we arrived back at the Yacht Club, Matt and Rob removed the old Norcold, somehow maneuvering it from the cabin, lifting it up the steps through the hatch, then sliding it over the rails to the finger dock. Then they unloaded the new one, carrying it down the dock, then doing everything in reverse. To make matters worse, we were in the midst of a heat wave with temps in the 90’s and very humid. Great day to be moving fridges! I was sweating profusely and I wasn’t doing much of anything except standing there and supervising. Felt really bad for the guys who were dripping from the exertion. But despite the high temps, somehow they accomplished the tasks at hand. After Rob hooked everything up and slid it into position in the galley, we waited for it to cool down. Freezer was okay but alas, the fridge section cooled down to the 50’s, then didn’t get any cooler. Even after waiting for 24 hours it still wasn’t much better than the old unit. Oh no! Did we get a lemon? On Monday, there still wasn’t any difference in the temp so Rob contacted Scott at Worldwide who said the symptoms indicated that there wasn’t enough freon in the unit, either because it hadn’t been serviced correctly at the factory or perhaps because it had a leak. Say WHAT? It CAN’T be field serviced? Not what we wanted to hear – it would have to be replaced! Scott called the factory, located in Canada, and had a replacement unit shipped out, telling us that it would take approximately 5 – 7 days. In the meantime, once the old Norcold was out, we moved it back to our coach. 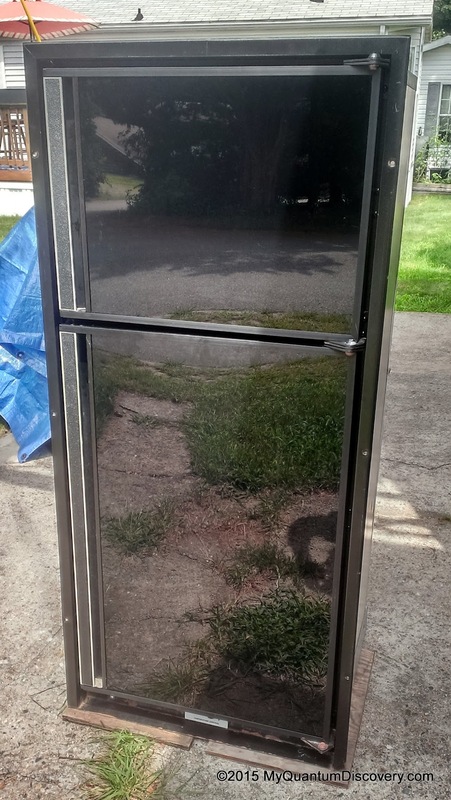 Rob put an ad on Craig’s list in the hopes that we could sell it. Success! Since it wasn’t working that great we only had an asking price of $50 (what our electric company, National Grid, would pay us for it). The guy that bought it wanted it for an older motorhome. Funny the night before he was coming to pick it up, Rob plugged it in outside the motorhome and after sitting overnight the temp was where it should be in the mid-40’s. Go figure! While we were waiting for the replacement unit, we decided to move on board anyway so we spent a day transporting all the kitties and all sorts of paraphernalia to the boat. 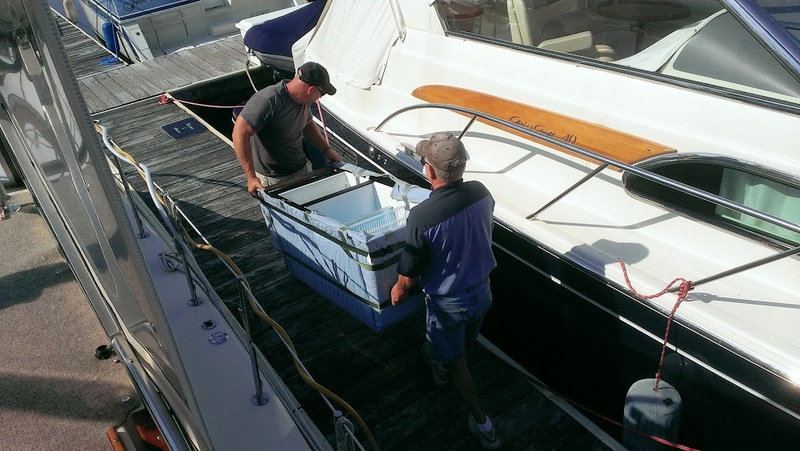 To keep some food necessities on board, we bought a cooler and borrowed a portable tabletop ice maker from Rob’s uncle to keep it filled. Just as well that it took so long for the delivery of the replacement fridge – Rob’s Dad (now living in Albany) and Rob’s brother, wife and three kids from Chicago were in town for the week so we wouldn’t have much time to deal with the fridge anyway. Things were even further complicated because we were taking a short trip to CT in the coach, leaving on Monday morning (will explain about that in a later post) so our window of opportunity to drive to Falmouth again was very narrow. Five to seven days did I say? HA, that was totally wrong! We reported the problem on July 28th, the new one didn’t arrive in East Falmouth until Friday, August 14th, nearly three weeks later. We do have to say though despite this aggravating snafu, the level of communication and follow thru by Scott and Marion at Worldwide was great – it wasn’t their fault and their level of service was superb. Although we were anxious to pick up the replacement unit, no way we were driving to the Cape on a weekend again! So we decided Monday 8/17 would be the best day to go get it. This time would be even more complicated than the first time – we would have to remove the defective unit before leaving East Greenwich and take it with us so we could swap it for the new (hopefully working) unit. To pick it up on Monday, we had to delay our motorhome trip to CT by a day. In prep for that trip, we moved the kitties and all our paraphernalia back to the coach on Sunday. Not a bad thing, we were still in the midst of a major heat wave. It was hot on the boat (we have AC but it’s not so great) so I was looking forward to basking in the cool AC on the coach. 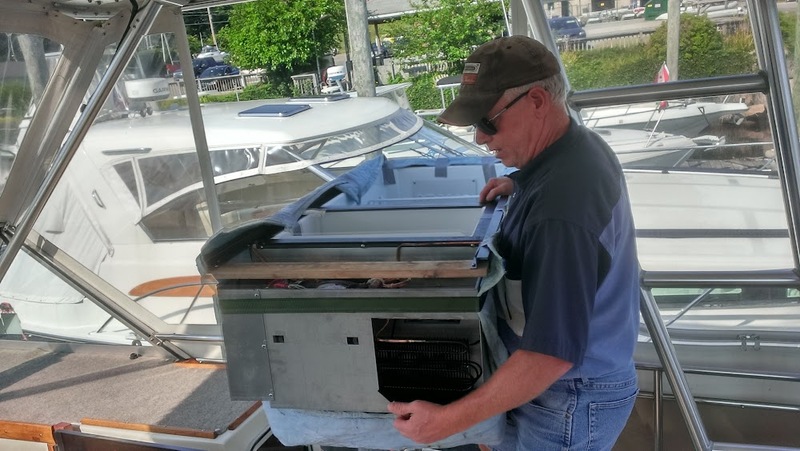 So on Monday, another fine sweaty day, back to the Yacht Club we went where Matt once again came to our rescue, helping Rob take the defective unit out. Off we went to the Cape! No traffic this time, thank goodness! When we picked up the new unit, I jokingly told Scott at Worldwide, “don’t take this personally but I hope we don’t see you again!”. To say we were a little nervous that the replacement might also have a problem is an understatement. Would we have to do this exercise a third time? Making it back to the club at 2:15 pm, Matt helped Rob bring the new one on board and down into the cabin. After he once again got everything set up, we anxiously watched the display of the temperature probe he put in the fridge, keeping our fingers crossed that it wouldn’t get stuck in the 50’s again. Within an hour or so, with the thermostat set at about mid point, the temp had fallen into the 40’s, then into the 30’s. Whew, it worked! So glad to have that exercise done with, now we can really chill out! Jim and I are so happy you now have the refrigerator in QL. We were wondering if you would have had to cut a bigger hole to get it down below. But the muscle men did a good job without cutting. Get the wine coming. Thank goodness, no cutting required. Not sure what we would have done if that was required. Excellent muscle power that’s for sure! Heck with the wine – it deserved a martini!